022.Grégoire Zabé – JavaMuseum 2010 – Celebrate! Grégoire Zabé is an artist and a designer, teacher at Ecole Supérieure des Arts Décoratifs in Strasbourg, France. His main interests are in collaborative cyberspaces, evolutive representation systems, internet as a dimentional and social space, individuals plunged into new media context. 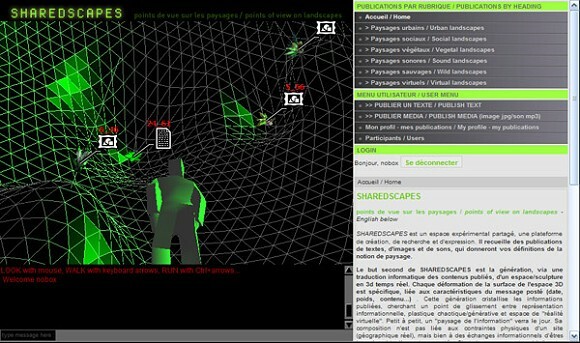 SHAREDSCAPES is an experimental shared space, a platform for creatvity, research and self-expression. It welcomes online submissions of texts, pictures and sounds, which will express your definitions of the concept of landscape. Through the medium of the technological translation of material published online, its secondary aim is to create a 3D space/sculpture in real time. 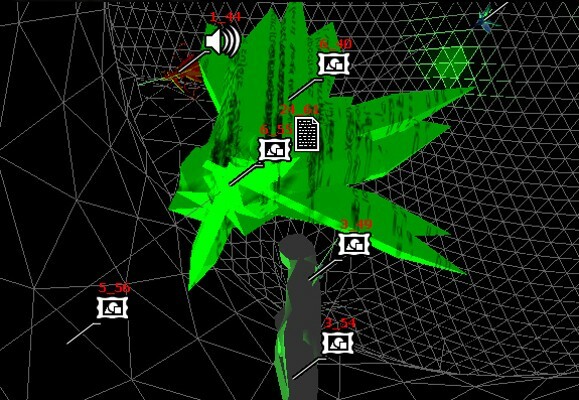 Each deformation of the 3d space surface is specific, linked to the characteristics of the message (date, weight, content…).This will crystalise that material, seeking to bring together computer-generated images, chaotic/generative modelling and a “virtual reality” space. Little by little, a virtual landscape will develop. Its composition will not be subject to the physical constraints of a site (in concrete geographical terms) but to the technological exchanges of human beings virtually connected to each other. It is in the ambiguous relationship between landscape and information that the essence of this project exists.